The CN3 – world’s smallest. INTERMEC has introduced the CN3, the smallest rugged mobile computer in the world. With integrated GPS and Bluetooth capabilities, the CN3 increases efficiency and improves safety by enabling onscreen and hands-free turn-by-turn voice navigation. With 3G WAN and Cisco Compatible WiFi connectivity, users can be connected with voice and high-speed data anywhere. Flexibility is increased by the ability to choose between GSM/EDGE and CDMA/EV-DO. Users can scan and decode any kind of barcode or capture still images such as signatures or video images that can be stored for later use or sent immediately anywhere in the world. With the introduction of the CN3, mobile workers can set aside the multiple devices they typically must carry and maintain – cell phone, GPS unit, pager, laptop, camera – for a single device. Used with mapping software, the CN3’s GPS system provides turn-by-turn directions to direct package delivery, direct store delivery and field service personnel to their destinations. Its 3G WAN, WiFi and Bluetooth communications systems equip mobile workers with voice and data services. A small and thin (157mm x 84mm x 30mm) computer, CN3 includes an optional 1.3 megapixel colour camera with flash that allows workers to document assets and damaged goods records at the point of transaction. The CN3 is powered by Microsoft Windows Mobile 5.0 software with the Messaging and Security Feature Pack, including Direct Push Technology for wireless e-mail, and comes with a QWERTY keyboard or an optional numeric keypad. 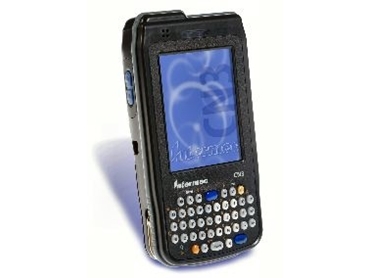 It has 128MB RAM, a 2D imager for scanning barcodes and a battery with enough power to last an entire shift, all housed in a case rugged enough to withstand tough work environments. The CN3 supports Intermec’s SmartSystems, the ADC industry’s comprehensive system for complete device management. The CN3’s standards-based design makes it easy and cost effective to integrate into most enterprises. It supports Cisco Compatible Extensions (CCX) for seamless interoperability in Cisco infrastructures.